Whoa! Baby it’s cold outside! Like, I can’t even mouth those words it’s that cold. Hobbits do not work when it’s that cold out and it hit a record -14 degrees Fahrenheit in my little corner of the world Saturday and into Sunday. Monday wasn’t much better at 2 degrees at seven am. So I guess what I’m saying, in my own little way, is that I didn’t zip up the old Carhart jacket and head over to the Hobbit House for a little house framing. Sorry to disappoint you folks but I just couldn’t bring myself to do it. Welcome again though to another installment of the Hobbit Hollow Construction Blog! I didn’t get to post Sunday night because I thought I would be working Monday and actually have something of substance to show you. Alas, no. The 2 degree Monday morning temperature helped put the kibosch on me getting motivated as far as the Hobbit house is concerned. I did go over to the house and take a look at what I have to do and how I might do it. The weather is supposed to get better for the upcoming weekend as far as temperature is concerned. So hopefully we can actually get reacquainted with the construction process. The holidays and the winter months really are tough though as far as getting work done. 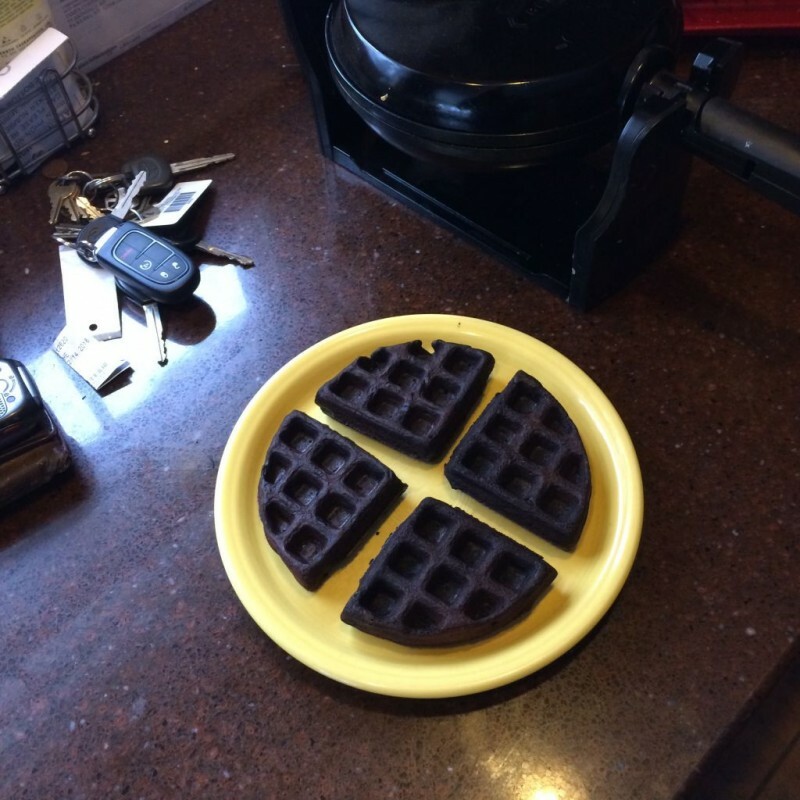 The Editor made waffles Monday for breakfast. That was nice. There was some batter left over so she made an extra one. Check it out. There was a point over the course of the morning when I was thinking, “Is something burning?” I went over to the stove and everything looked fine. The kitchen just smelled like a bag of charcoal. I should be able to use that waffle to cook a couple of burgers once the weather breaks. And one other thing….not that anyone really cares. I had to go out to dinner with that Mother-in-Law of mine. We were supposed to split the appetizer. We got the oysters. Four of them. I don’t know but where I come from splitting four oysters means that you get two oysters and I get two oysters. Apparently where my Mother-in-Law comes from it means three for her and one for me. Like I said, not that anyone really cares but I just want to clear the air, if you will. That’s all. Oh yeah, I’m not even going to go into dropping her back home after her drinking two Stoli’s on the rocks….with three olives mind you. (I mean who do you know that asks for three olives?!?!) Let’s just say when I die I’ll be going to heaven. I’m going to leave it at that. Okay Jim, we know there are issues you are dealing with and we need you to get beyond those issues and find the correct focus. Hmmmm. I think you’re right. I really have to try and move on here and get back to this house. Gotta make it happen. Anyway, stay warm and I hope to see you all next week! Thanks for dinner saturday night I really enjoyed it.Then I always do when your paying.I must say the oysters were great to bad you weren’t quick enough to get two. I get three olives because you all want one then there’s none for me. As for the burnt waffle smell did it get rid of the little old lady smell?